I bought this baking and dessert book, The Sweet Life, Desserts from Chanterelle, by Kate Zuckermann quite some time ago, and this is the first recipe that I've tried. This is a beautiful book, one that I would read over and over, never get bored, with lots of recipes that I've bookmarked to try but somehow or other, always got pushed over by recipes from other sources! Would you believe it that I actually felt quite guilty for not trying a single recipe from this book? Dozens of times that this book has been taken from the bookshelf into my hands and pages flipped over, read and read again, bookmarked, read again the next night, back to the bookshelf and will be repeated again a few days later! About time to put that guilt to rest! Pineapple-Rosemary Sorbet seems like the perfect choice to do just that! Kate Zuckermann is the pastry chef of award-winning New York City restaurant, Chanterelle. This book covers ten chapters ; Tarts, Cakes, Cookies, Custards/Puddings/Cremes/Mousses, Souffles, Ice Cream/Sorbets/Frozen Desserts, Roasted Fruits/Fruit Soups, Chocolate and Candies, Edible Garnishes and Snacks, Sauces and Cream Accompaniments. The one thing that I like about this book, are the hints and techniques that can be found throughout the book. 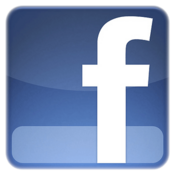 Though I may not be able to bake some of the recipes because of the unavailability of certain ingredients, except maybe if I can find a close substitute, I'm looking forward to a few that I've already bookmarked. A ripe pineapple from the market and some rosemary sprigs from my garden. Remove the "eyes" from the pineapple, place it in a pot with some water and sugar. Let it boil and simmer for about 5 minutes, add in the rosemary, making sure they are submerged in the syrup. Cover and leave to steep for 10 minutes. Blend the pineapple together with the syrup, strain over a wire mesh, press to drain out all juices, discard the pineapple pulp which is really very little. Stir in salt, leave it to cool, add in squeezed lime juice, cover and place in the refrigerator to chill overnight. I got about 3-1/2 cups of base sorbet. When chilled, churn in the ice cream maker till mushy and the consistency of soft whipped cream. Transfer to a container and freeze in the freezer for at least 4 hours. Enjoy! This is a refreshing, lovely sorbet. The flavours of the pineapple is really fresh, do not skip the lime, as I think that it complements well with the freshness of the pineapple. The only thing is I will add on more sprigs of rosemary when I make this the next time, as I can hardly smell the fragrance of the rosemary. And one more thing, I added in a big pinch of salt, influenced by David Lebovitz! I think that this is another ingredient that should not be skipped. All in, this is a wonderful, refreshing, flavourful and light sorbet that I'm sure everyone will enjoy. For this Pineapple-Rosemary Sorbet, I made half the recipe, about 1.8 pounds of pineapple and 1/2 cup sugar, as my ice cream maker can only accommodate 1 quart amount. The recipe below is the original from the book. With a sharp knife, remove the top and bottom of the pineapple. Stand the fruit up and carve the skin off in long, slow strokes. Slice the carved pineapple down the center and lay each half, flat side down, on a cutting board. Cut the halves into 1/4 to 1/2 inch thick semicircles. In a stainless-steel-lined saucepan, combine the sliced pineapple, sugar, and 2 cups cold water. Bring to a simmer and cook for 5 minutes. Add the rosemary and remove the pan from the heat. Make sure the rosemary is submerged in the liquid, cover the pan, and set it aside for 10 minutes. Puree and strain the pineapple. Remove and discard the rosemary. Scoop half of the pineapple and some of the cooking syrup into a food processor or blender and puree on the highest speed for 2 minutes. 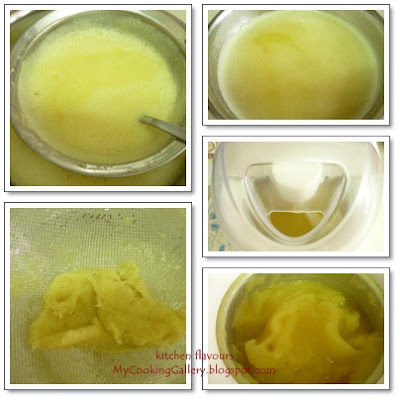 Transfer the puree to a bowl and repeat the process with the remaining pineapple. Pass the pureed pineapple through a fine-mesh strainer and into a stainless-steel bowl, pushing the fruit through the strainer with the back of a ladle or a rubber spatula. Discard the pulp. Place the bowl in an ice bath to chill. Once the mixture is chilled, add the lime juice. The sorbet base will be sweet. Some of the sweetness will be tamed by the freezing process, but if you find the sorbet base cloyingly sweet, add more lime juice. If the sorbet base does not seem that sweet, try adding a few teaspoons of superfine sugar. Transfer to the refrigerator to chill for a minimum of 1 hour or up to 2 days. Churn the sorbet in an ice cream machine according to the machine manufacturer's directions. The sorbet is finished once it has increased in volume and it holds whisk lines from the stirring mechanism and mounds like softly whipped cream. Transfer to the freezer for 4 hours to attain a scoopable consistency. This sorbet is best if you serve it 4 to 6 hours after churning, but will keep in the freezer for up to 1 week. By hand : Pour the mixture into a plastic tub or similar freezeproof container. It should not be more than 4cm/1-1/2in deep. Cover and freeze in the coldest part of the freezer for 4 hours or until it has partially frozen and ice crystals have begun to form. Beat until smooth with a fork, or hand-held electric whisk. Alternatively, process in a food processor until smooth. Tip : If making by hand, ensure that the freezer temperature is as low as possible to speed up the freezing process, and beat at regular intervals. What a lovely combination! I have never had a sorbet flavoured with rosemary. Joy what a stunning frozen confection, I need to get my ice cream maker out! Tongue slurping Ice Sorbet...my favourite kind with pineapple! I dont have an ice cream maker, can I just put in a blender instead, will it turn out like yours? Refrescante y exquisito una combinación perfecta y también su elaboración,cariños y abrazos. Ooo my beloved friend , lovely !!!! This recipe sounds perfect for spring and summer with fresh rosemary from the garden! I can't wait to try it in my ice cream machine. It came out with lovely colour, it must be as tasty as it looks. Lovely colored Sorbet.Rich and yummy treat.Nice post,thanks for sharing this recipe. Oh my goodness, Joy, what a gorgeous photo!! Look at the colour of that sorbet. Beautiful! I'm glad I'm not the only one who has cookbooks and not a single recipe has been made from them, lol! Many thanks for so kind words on my blog ! that my home is open for you, if come to Greece for holidays. Sounds really lovely! I have make pineapple and mint sorbet before, but never with rosemary. It look like a great idea, and of course I bet that you have some wonderful pineapples there :-). lovely and such delighting flavours! you must love ice cream a lot that you have an ice cream maker at home..how much did you get yours? 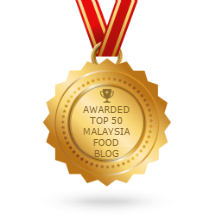 also to let you know that the ice potong is up today in my blog. That sounds like it would be the perfect dessert for a hot summer day. The flavor combination must be amazing! 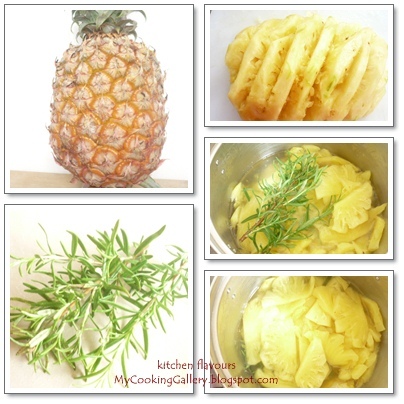 Never thought of making sorbet with rosemary and pineapple,interesting and flavourful combo for sorbet..refreshing! oh nampak sungguh sedap.Nenas memang menjadi pilihan,tak kira lah makan begitu saja atau dimasak atau pun buat jus.Sedap sekali. Incredible! That is the most beautiful bowl of sorbet I've ever seen - I just want to dig right in! I've always wanted to try herbs in ice cream/sorbet. It looks delicious! I wanted to stop by and Thank You for your kindness. Your kind words have been a comfort to me and I will carry them in my heart. Thank you for caring and remembering me. absolutely stunning recipe...awesome clicks again dear..
Yum! This looks so refreshing and delicious. I made a lot of fruit sorbets last summer, but never thought of adding herbs to them. A great idea and will definitely keep it in mind this summer. Thanks so much Joy for your trouble of showing the manual version of making your yummy sorbet. I will indeed try it soon! Thank you for stopping by and I appreciate your sweet comments! Hope that you will give this a try, it is really refreshing and delicious! Let me know when you do! Have a lovely day! What a lovely combination! I would of never thought to pair them together! It looks so luscious and scrumptious. Sharing this great recipe on my Wednesday and wandering list, thanks so much.